I think they may have their own market. After all Caliver still manages to sell Minifigs at modern prices. I thing the Mini Fig ranges have stood the test of time although not to every bodies taste I will admit . I think you may be correct? There must be some old Minifigs stalwarts out there though, who will bite your hand off??? It's just a matter of finding them. Thanks for this post, David, I did not know that Caliver had the old Minifigs lines. Sadly, the ones I looked at have not aged well, though as a nerdy kid in the 70s, I loved the big Minifigs catalogues and still have some in my collections. I am sure that they are still popular in certain quarters but I wonder if that is primarily from the 15mm side? All of my immediate gaming circle have moved away from the 25mm ranges as stylistically they just do not work as well with more ‘modern’ styles of sculpting. I agree with you and would have no problem raising armies using them. Firstly, I hope you are well and on the mend. I like Minifigs and would use them but they look quite dated compared to more modern figure ranges. They look plain odd and old fashioned against such things as Front Rank but let us not lose sight of the massive impact they have had on wargaming as a whole. As you rightly say there are stalwats out there - it is just a case of finding them! I also remember with fondness those big old catalogues - and the thrill as one dropped through your post box! I have not seen how the figures look today and suspect that you are right given that he moulds are probably quite mature. Most of the Minifigs that Eric has would have been acquired during their heyday - mid to late 1970s - so despite being old are quite crisp. Ebay will undoubtedly feature at some point but to begin with I want to see how far I can get on a collection/delivery basis. Shipping overseas I will be expensive given the amount of figures we are talking about but may still be attractive to devotees. We will have to see how it plays out. Good post David, I came full circle re Mini Figs after seeing them as a poor man's wargames figures for many years. Now, well I was lucky enough to buy a lot of ECW Mini Fig castings very cheaply a couple of weeks ago and am mixing them with my Hinchliffe ECW for my latest project. They are just different to paint than the Hinchliffe which to be honest isnt a problem, I just line them more. Ive yet to tackle some of their notorious horses but the actual cavalrymen are lovely sculpts. Huzzah! I would quite cheerfully use Minifigs for all my gaming needs so it is good to see someone else keeping the faith! There is an awful lot of Minifigs in this collection - mind you there is even more Front Rank etc! I remember seeing a full page advert for the Minifigs AWI range in one of the magazines years ago and being gobsmacked by the extent of their coverage. Two very good gaming chums of mine used to produce some quite stunning paint jobs using Minifigs 25mms and so it is certainly possible to do as you suggested to fit them in. If I am honest I am not convinced that the painting is the problem - more likely the very different style of Minifigs not fitting in with contemporary models as well. I used to like the ECW range although I have never gained the period. DC.. I think the guys have it really.. there's nothing wrong with the range.. far from it... it's just the style is no longer fashionable... 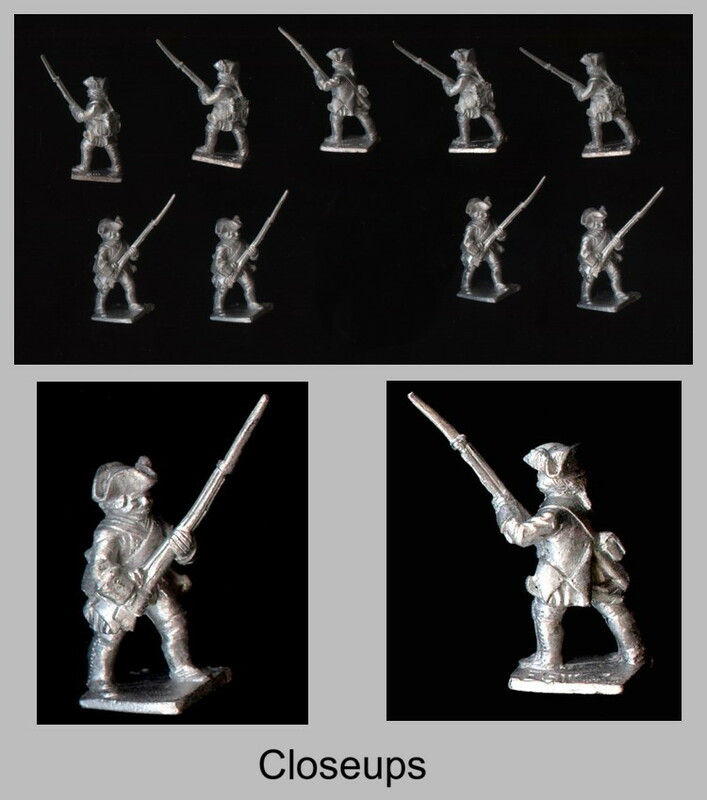 I still buy and use their 15mm Marlburian infantry as the sculpt is elegant to the point of beautiful, but even with a collection like the 25mm AWI one that I have, I can't see me buying any more... when I looked at figure ranges at the start of my ECW project I discounted the 25mm Minifigs (style aside, buying new they are quite expensive) and that despite some of my favourite memories being of going to the factory shop down in Northam Rd in Southampton.. magic! In my opinion I reckon that Caliver Books may have missed a bit of a trick with their pricing of the Minifigs range as, to be honest, I think they are currently too dear. I appreciate that metal and labour costs are the same as for other manufacturers but then how does Spencer Smith produce their 30mm old school range as cheaply as they do? Probably not a good example as I believe that Peter is a one man band. If it costs as much for a Minifigs 25mm figures as it does for a Front Rank equivalent then I reckon most gamers would opt for the latter. 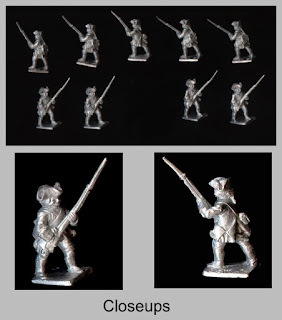 If I can get some mileage from the 18th century Minifigs in Erics collection in terms of suffient to build armies then I would certainly look to do so. That way buying the odd full priced figure from Caliver would not seem so daunting. All the best and many thanks for flying the Minifigs flag!